Section 1: Preparation, Structure and Properties of New and Modified Inorganic Sorbents. Computational studies on the design of synthetic sorbents for selective adsorption of molecules (R. Vetrivel et al.). Controlled porosity glasses (CPGs) as adsorbents, molecular sieves, ion-exchangers and support materials (A.L. Dawidowicz). Influence of pH of precipitation of hydroxides on the structure of co-precipitated adsorbents (V.S. Komarov). Colloidal silicas (S. Kondo). Complex carbon-mineral adsorbents: Preparation, surface properties and their modification (R. Leboda, A. Dabrowski). Solid-phase hydrosilylation reactions with participation of modified silica surface (V.A. Tertykh, L.A. Belyakova). Structure and molecular organization of bonded layers of chemically modified silicas (A.Yu. Fadeev, G.V. Lisichkin). The chemical basis of surface modification technology of silica and alumina by molecular layering method (A.A. Malygin et al.). Kinetics of organic compounds chemisorption from the gas phase on oxides surface (V.I. Bogillo). Functionalized polysiloxane sorbents: Preparation, structure, properties and use (Yu. L. Zub, R.V. Parish). Surface structure and molecular adsorption of apatites (T. Ishikawa). Surface chemistry and adsorption properties of Al13 colloids (J.Y. Bottero, J.M. Cases). Section 2: Adsorption from Gaseous Phase. Computer simulation of adsorption on amorphous oxide surface (V. Bakaev, W. Steele). On the nature of the energetic heterogeneity of water/oxide interface in adsorption phenomena occurring at oxide surface (W. Rudzi&nacute;ski et al.). Energetic heterogeneity of porous inorganic oxides: Adsorption and chromatographic studies (M. Jaroniec). Adsorption kinetics on real surfaces (G.F. Cerofolini). Inverse gas chromatography in the examination of acid-base and some other properties of solid materials (A. Voelkel). Chemical and morphological characteristics of inorganic sorbents with respect to gas adsorption (E. Papirer, H. Balard). Structure and properties of the films formed by organic substances on silica gel surface. Investigations by inverse gas chromatography (IGC) (J. Rayss). The use of gas chromatography to study the adsorption from gaseous phase at the infinite dilution (F.J. López Garzón, M. Domingo Garcia). Molecular statistic and gas chromatographic study of hydrocarbons adsorption on the modified layer silicates and silica in the Henry region (Yu.I. Tarasevich et al.). Micropore filling mechanism in inorganic sorbents (K. Kaneko). Phase transitions in adsorbed layers (A. Patrykiejew). Drying of gases and liquids by activated alumina (S. Sircar et al.). Section 3: Adsorption from Solution. 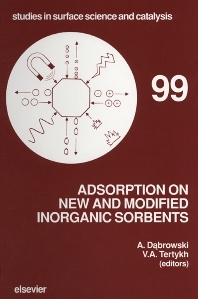 Characterization of inorganic sorbents by means of adsorption at the liquid-solid interface (A. Dabrowski et al.). Study of adsorption from solutions by chromatography (V.Ya. Davydov). Equilibria of adsorption from solutions on the silica surface (V.A. Tertykh, V.V. Yanishpolskii). Adsorption from dilute solutions - some novel aspects (P. Nikitas). Ion adsorption on mineral oxide surfaces (L.K. Koopal). Recent progress in the studies of adsorption of ionic surfactants from aqueous solutions on mineral substrates (J. Zajac, S. Partyka). The reaction of anions and cations with metal oxides as models for their reaction with soil (N.J. Barrow). Problems in modelling the electrical interfacial layer in metal/oxide aqueous systems (N. Kallay et al.). Adsorption and immersional wetting on hydrophilic and hydrophobic silicates (I. Dékány). Liquid chromatography of fullerenes and study of adsorption properties of fullerenes crystals (V.Ya. Davydov). Subject Index.